Come relax at a quiet campground alongside a clear Vermont mountain stream. You can also enjoy the many opportunities in our area for outdoor recreation. We offer sites for tents and small trailers/RVs, as well as a variety of rental accommodations including a lean-to, riverside cabin and a 1 bedroom apartment above the bath house. New rental option: 2 bedroom 1 bath 2 story timber frame house. This small campground is an ideal location for an event involving 50-100 people. Please contact us if you would like to discuss reserving the campground for your group. To ensure an enjoyable stay for all our campers, we do not allow pets at the campground and we strictly enforce reasonable quiet hours. (Changes to these regulations may be negotiated for groups renting the entire campground.) We require that everyone respect their fellow campers and the environment. 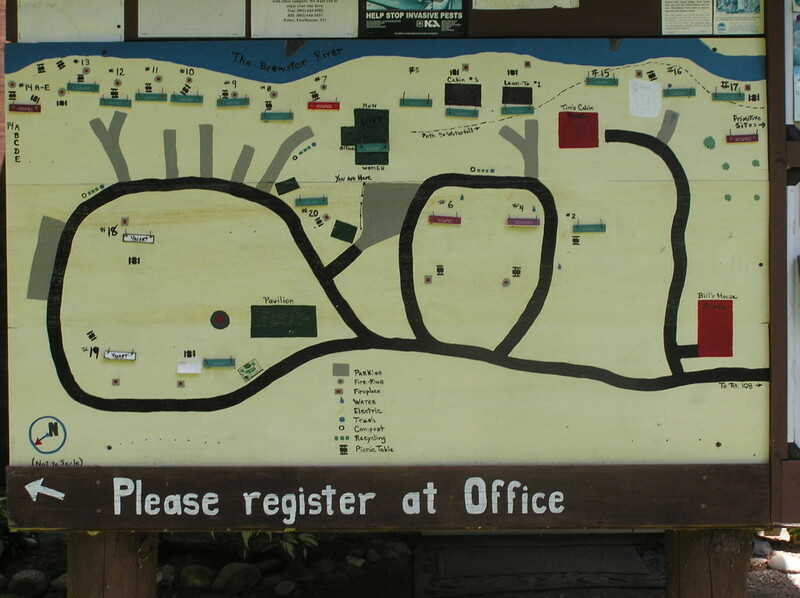 The bath house is located near the top center of the map. Sites #7-14 are on the river to the left. Sites #15-17 are on the right. The Pavilion and sites #18-20 are located in the circle at the lower left. Sites #2/4/6 with hook-ups are located in/near the center circle. 2018 Season- We are closed for the season, thank you! Unfortunately the Pavilion was hit by a micro-burst windstorm and was a total loss. The field sites are still available for group gatherings. New rental option starting Labor Day weekend: 2 bedroom 1 bath 2 story timber frame house, see rentals page for contact information. Please do not use the campground email or phone # for inquiries about this rental option, thank you! Note: If you are planning a visit and are pulling any type of camper/trailer. Our driveway is gravel and a fairly steep grade, we strongly recommend AWD or 4 wheel drive. Please check beforehand if you have any doubt on accessability. No arrivals after 10pm without prior approval. The access road is NOT suitable for vehicles over 19′ in length (6m) or those towing a trailer over 14′ long (3.5m). The turning radius off and onto VT. 108 makes entry and exit unsafe for longer vehicles and we CANNOT accommodate such vehicles. At the summit of Smugglers’ Notch, VT. 108 is not plowed to remove snow and that section of the road is closed from around mid-October to mid-May. Check www.511vt.com for current conditions in spring and fall before traveling through Smugglers’ Notch. Road closure signs are posted and barriers erected on the road beyond the ski areas on both sides of the Notch.